A French delegation led by the Minister of Europe and Foreign Affairs, Jean-Yves Le Drian, met Prime Minister Barzani, Deputy Prime Minister Talabani and other senior KRG officials in Erbil. France and the Kurdistan Region of Iraq have strong bilateral ties. The Prime Minister thanked the French Republic for its continued support of the Kurdistan Region, especially regarding the fight against terrorism, remembering how France is an important member of the international coalition. Barzani appreciated the role of President Emmanuel Macron, who supported the Kurdistan Region during difficult times. 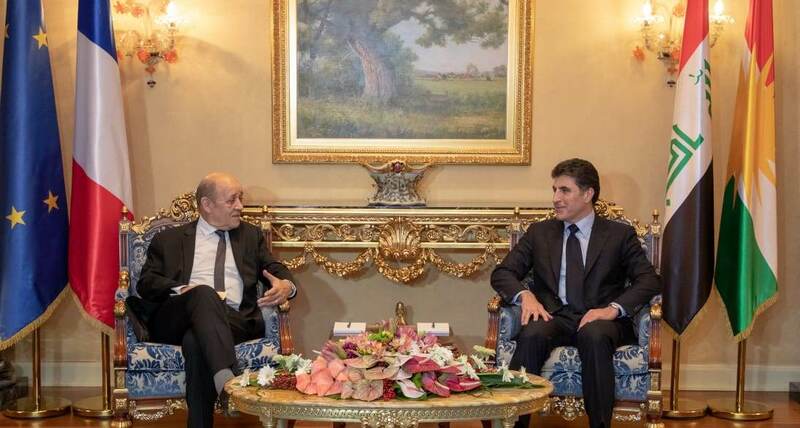 The French Foreign Minister stressed his country’s willingness to strengthen bilateral ties and urged the Kurdistan Regional Government and the Iraqi Federal Government to engage in meaningful dialogue in order to settle their differences.